Kellogg's is reducing the sugar content in a range of its breakfast cereals by 15%. The move comes after criticism that high levels of sugar, salt and fat in cereals are contributing to childhood obesity. 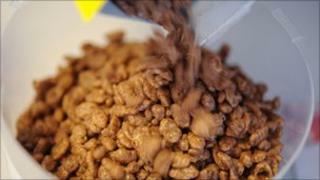 The change will happen next year in four of the firm's Coco Pops products. Greg Peterson, Kellogg's UK managing director, said: "We have listened to mums. They want a balance: lower sugar cereals which children will still eat." He added: "We have invested millions of pounds and thousands of staff hours over the last two years to make this happen, and will do this without compromising the taste." At present Coco Pops contain 35% sugar. After the reduction the level will go down to 29.75 %. However, it will still be almost double the maximum amount recommended by the Food Standards Agency of 15% - the amount where sugar turns red on the traffic light labelling system. Kellogg's move follows a trend of reductions - particularly in salt levels which have fallen significantly in a range of food products in recent years. Lucy Jones, from the British Dietetic Association, said Kellogg's had made a small move in the right direction. She said: "It will make a difference to the overall sugar percentages in a diet and of what nutrients are making it up. "But certainly it would benefit from further reductions in sugar as we want to limit the refined sugars in our diet. "They can affect your teeth, your blood glucose levels and ultimately your weight management." Four out of 10 people have a box of Coco Pops in their cupboard. Mother of three Sarah Hardcastle limits the amount she gives to her daughters to what she calls "high days and holidays". She said: "My perception is that it's very full of sugar. It must be, it's covered in chocolate. "I don't give my kids chocolate every day on any other occasions so I certainly don't want to give it to them it at breakfast every day." Nutritionists have long argued that breakfast is the most important meal of the day. Going without can lower concentration and energy levels and can lead to weight problems later in life. Nonetheless one in six children does not eat breakfast. Mr Peterson said the company was committed to further reducing sugar levels in the future. "This is a process, so while we have announced we are taking 15% of sugar out by mid-next year, we will go further if we can take people's palates with us."